This is magnificent. 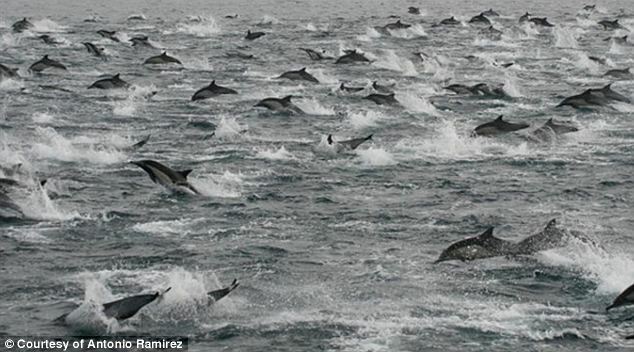 I once saw a similar school of dolphins off the northern San Diego coast as I was driving on Pacific Coast Highway. But there weren't anywhere near this many. If you follow this blog you know that I love dolphins and elephants, among many other things. But this is truly a breathtaking image. 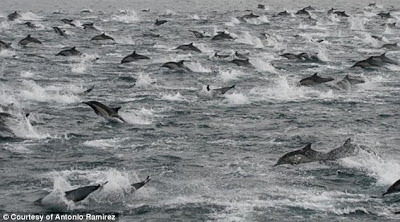 A group of over 100,000 dolphins spotted off the coast of San Diego caused a spectacle for nature watchers as they traveled together in an enormous pack. 'They were coming from all directions, you could see them from as far as the eye can see,' Joe Dutra said after seeing the spectacle first hand. Mr Dutra, who captains Hornblower Cruises, was out on his daily tour with a boat full of nature watchers when he spotted the massive group of dolphins. 'I’ve seen a lot of stuff out here… but this is the biggest I’ve ever seen, ever,' he told the local NBC affiliate. Dolphins typically travel in groups of anywhere between 15 and 200 which are called pods. What Mr Dutra spotted on Thursday however is best described as a super mega pod given the astonishing size of the group. He estimated that the trail of dolphins was seven miles long and five miles wide, and he was able to steer the boat alongside them for over an hour. Experts are unable to pinpoint any specific reason as to why so many of the mammals were traveling together on this particular night. 'They’re definitely social animals, they stick together in small groups. But sometimes, the schools come together,' marine expert Sarah Wilkin told NBC. While it does seem like a once-in-a-lifetime experience, a very similar flock of thousands of dolphins were seen swimming together about this time last year. At the end of February in 2012, an unspecified group of dolphins was spotted swimming about 65 miles north of San Diego, implying that there may be an unacknowledged migratory pattern. BEST NEW architecture in the LAST century? ?